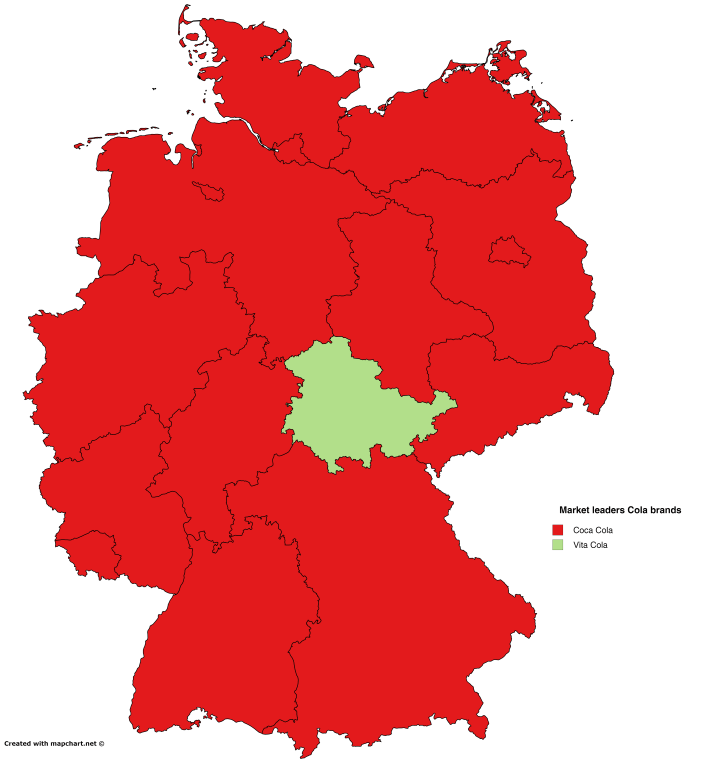 The former Easter German state of Thuringia (population 2.1 million), is the lone holdout, preferring Vita Cola to Coke. Never heard of Vita Cola? That’s not too surprising, since it was one of the German Democratic Republic’s (East Germany’s) national cola brands. Vita Cola’s flavor is described as cola-like with a strong note of lemon and fruit flavoring. It is also noticeably less sweet than Afri-Cola, Coca-Cola or Pepsi, and has a slightly thicker consistency due to its use of citrus and other aromatic oils in the formula. After the fall of the Berlin Wall and Iron Curtain in 1989, Vita Cola’s businesses collapsed, even though at its peak it had been bottled in over 200 factories. However, it was rescued by Thüringer Waldquell from Schmalkalden, Thuringia in 1994 and since that time has remained the most popular cola in the state. Interestingly, East Germany had its own version of the cola wars with Club Cola being a challenger to Vita Cola. It too faced a similar collapse in demand following the fall of the Berlin Wall and it too has subsequently also been revived.